The following chart was created to provide an easy-to-use, up-to-date reference on mintage limits, product limits, and household order limits for items currently offered by the U.S. Mint. It currently shows only those products featured on the mint’s weekly cumulative sales report, though some items of interest will remain on the chart after they’ve sold out in order to retain as much useful information as possible. After establishing mintage, product, and order limits, the U.S. Mint does not always regard them as final, and will at times make adjustments. This chart will be updated periodically. As the mint sometimes makes adjustments without notice, please feel free to suggest updates and corrections in the comment section. For ease of comparison, the following chart is set up like Coin Update’s weekly U.S. Mint sales report. The first column displays the mintage limit of a given item, the second column presents its product limit, and the third column shows the household order limit, if there is one. Aterisks (*) indicate a mintage number that applies to several products combined; where applicable, the next line down lists which items fall under the relevant limit. What is the difference between product limit and mintage limit? Steve G, They may have made 500,000 March of Dimes silver dollars but they only made 75,000 of the March of Dimes 3 coin set which includes the dollar. Why did they yank the Eleanor Roosevelt 1st Spouse after less than 1/2 the mintage limit while leaving the others? Break the die? 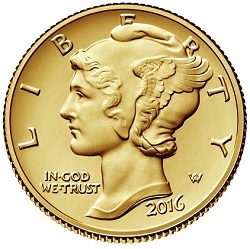 The 2016 Mercury Dime Centennial Gold Coin offering was a fiasco. Sold out in a few minutes ? I can’t believe more small collectors (such as myself) aren’t making complaints to the Mint.